If RAYMAN made sweet, sweet love with RAMPAGE, and nine months later their baby was raised by BIT.TRIP RUNNER (the family butler), that creation would be named RELENTLESS REX: THE VIDEO GAME! It's a hand-drawn, fast-paced, action-adventure platformer in which you help an assortment of characters explore and race through dangerous locations, using your environment, special power-ups/weapons, and the help of others to try (in vain) and escape my bloodthirsty jaws. But just when you think you're safe and you're chillin' at the local tavern, I come storming back again and again, destroying everything in my path and stopping at nothing to catch my next meal (you). Designed to be a community crowdsourced project, Kickstarter pledges give supporters a say in the design of this game's characters, powers, and environments. Want a radioactive Rexzilla that spits out fiery meteors while inside a giant monkey's guts?—Done! Want an Alien Queen Rex (complete with chest-bursting parasite) chasing a transforming robot out through a space ship's air lock?—You got it!!! (Levels can be as crazy as your mama after a case of Red Bulls.) Fun with a dark sense of humor, your ever-changing roster of runners will be subjected to all manner of twisted tortures during their escapes. And even if you successfully navigate each perilous course, you still may not make it out alive! (Hint: A dinosaur's gotta eat.) After all, I'M the star of this game—NOT YOU! This ain't your great great great great great great great great grandcestor's video game! running-platformer mashup (first one produced by a T-Rex anyway)— When you need to explore and interact with characters, you're PLATFORMING. But when there's a T-Rex on your @&%$#, YOU RUN, SON !!! co-design characters, Rex-modes, backgrounds, and more! Financial supporters vote for future content or submit their own, unique ideas! The variety and insanity of this game is only limited by the size of your tiny human brains! game, which means more characters for you to help create and play! animated in different styles by amazing, new game artists, keeping your experience visually fresh! "How fast?" Why don't you ask the last five runners I chased down? Oh, that's right... THEY DIDN'T MAKE IT !!! death-defying adaptations as you desperately race to find radical power-ups to help you prolong the inevitable escape certain death. and humor with a dark streak—SO ENGAGING it will attract your kids, SO TWISTED it will send YOU to therapy. where the last one left off, creating a real sense of a perpetual chase! I'm RELENTLESS! I will hunt you down if you don't support my game... DON'T TEST ME HUMAN!!! 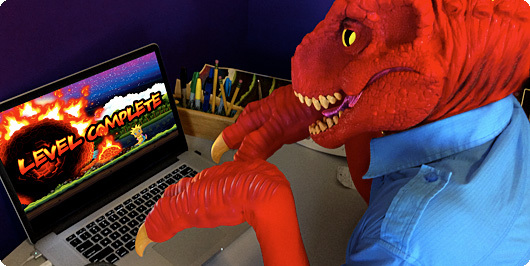 Check out the media page for sweet screenshots, illustrations, GIFs, videos, and what it's like to be a modern-day game dev T-Rex.